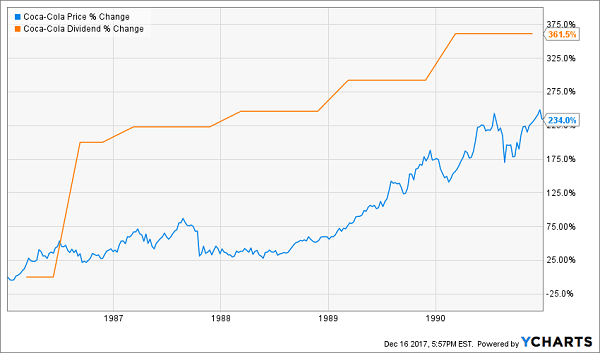 Have you always wanted to buy a safe stock like Coca-Cola (KO) and get rich from it like Warren Buffett? It’s doable. But most investors “live in the past” and fixate on dividend track records rather than a payout’s forward prospects. And looking ahead is the key to yearly gains of 10%, 15% or even 20% or more with dividend aristocrats. It didn’t really matter if you bought shares before or after the company was officially a dividend aristocrat. The driving factor for profits was the dividend’s velocity – it was moving higher quickly, so its stock price followed. Why is Coke’s dividend slowing down? Simple – just look at the top line. It sounds obvious, but income investors often wade so deep into the dividend weeds that they ignore obvious cues – such as shrinking sales. Coke’s top line has shrunk by 22% over the last five years. Which makes its dividend growth quite the feat! Contrast this with the 1986 to 1991 period, when the company was younger and still growing. It boosted its sales by 30% over that time period. Of course it’s possible to grow payouts faster than profits and sales. In fact, this is what often happens with dividend payers. But even the most gifted managers can only squeeze so much in payouts from a shrinking pie. It’s better to focus on businesses with the winds at their backs. In a minute, we’ll discuss five Dividend Aristocrats that have years and even decades of profitable runway ahead. Coke’s future business prospects don’t pass my taste test. Consumers are turning away from its core product of sugary beverages. The company knows this, and is expanding into other segments such as health and energy beverages – but it’s forced to pay up for hot products. We’re better off focusing on companies that are generating sales and profit growth organically. From there, we choose the firms that are financially fit enough to dish an increasing amount of their profits back to their shareholders every year. That’s how you buy the best dividend aristocrats, those that will keep their titles for years and even decades ahead. Here’s a five-pack with well-positioned businesses for 2018, 2028 and 2038 and beyond. Medtronic (MDT) is a medical device company that has its hands in numerous areas. About 35% of its revenues come from its cardiac and vascular group, a third from minimally invasive therapies, a quarter from restorative therapies and the remaining 6% from its diabetes group. At the ground level, that means Medtronic makes devices such as insulin pumps, aortic stents, heart valves, electrosurgical instruments, tracheostomy tubes and surgical imaging systems. The view from 10,000 feet is incredible. Healthcare costs have been rocketing unchecked seemingly forever, and the aging of the baby boomers is only helping to drive up demand for these life-lengthening products. These trends aren’t stopping anytime soon, with healthcare costs expected to climb 5.5% annually between 2017 and 2026, when they’re expected to reach $5.7 trillion. The company’s most recent quarterly report exemplifies Medtronic’s continued growth, including a 10% top-line boost from its cardiac and vascular products. Net sales overall were a little slow, growing 1.2% to $7.4 billion, but they did beat estimates. More importantly, analysts expect the bottom line to grow in the high single digits for at least the next five years. MDT also is generously expanding its dividend, which has grown by 64% since 2014. 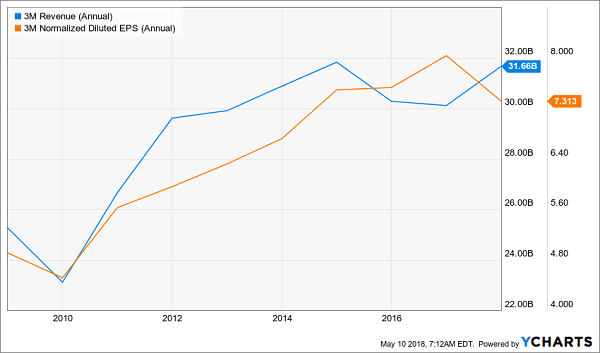 The company’s projected profit growth, as well as a payout ratio of about 39% of this year’s expected profits, means Medtronic should have plenty of ability to improve its dividend in the years and even decades ahead. Becton, Dickinson (BDX) is another medical device company that, like Medtronic, spans numerous healthcare needs. Becton’s product lineup covers areas ranging from anesthesia delivery, diabetes care and cervical cancer screening to infection protection, molecular diagnostics and specimen collection. It’s also one of the few companies that can actually claim to have swallowed up a fellow Dividend Aristocrat. As a result, Wall Street is high on Becton, Dickinson’s prospects for the years ahead. Analysts project average annual earnings growth of 14% for the next half-decade, including a 16% bump in 2018. Meanwhile, BDX should extend its 46-year dividend growth streak sometime later this year. Since 2014, the payout has plumped up by a healthy 38%, and there’s ample room to continue considering a meager 27% payout ratio based on 2018’s projected profits. This is an industrial gases company that produces carbon dioxide, argon and oxygen, among other common gases, not to mention other specialty gases, mixtures and even handling equipment. In fact, Praxair even goes a step further by providing whole management-and-delivery systems, doing everything from cleaning to leak detection to inspection. The beauty of Praxair is that industrial gases tend to be critical to operations but also a small portion of costs. Meanwhile, the company deals in contracts that are up to 20 years in length, meaning that it has some extremely established customers it can rely on to keep driving cash flow. At the moment, Praxair is working on asset sales to facilitate its planned merger with German chemical giant Linde Group AG. The marriage should create $1.2 billion in annual cost and capex synergies and efficiencies. PX is a newcomer to the Aristocrats, joining Roper Technologies (ROP) and A.O. Smith (AOS) in 2018 after notching its 25th consecutive year of dividend hikes. Expect it to keep up its membership well into the future, with analysts expecting double-digit annual profit growth for the next five years at a minimum. Yes, I’m well-aware that 3M (MMM) doesn’t exactly look like its sterling self right now. After all, the name behind Post-it Notes, Scotch Tape, Thinsulate and Nexcare healthcare products is coming off a rough first-quarter earnings report in which it guided both its full-year organic growth rate and profits lower. 3M shares are now off nearly 14% in 2018 – one of the largest pullbacks in MMM in years. 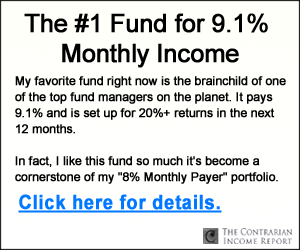 That gives investors the chance to jump into one of the most successful industrial companies on the planet for … well, at just less than times forward earnings, not exactly a bargain, but a more reasonable price than investors have been offered for some time. 3M, after all, offers more than 55,000 products that cover everything from adhesives to dental implements to fire protection to car care. 3M generally benefits from a growing global economy, and its outstanding product diversification means that if one area slumps, there are dozens of other categories there to pick up the slack. Despite the Q1 warning, analysts still are expecting 9%-plus annual profit growth on average for the next five years. Meanwhile, MMM just celebrated its 60th consecutive dividend increase – a 16% improvement that keeps 3M among the ranks of the longest-serving Dividend Aristocrats. 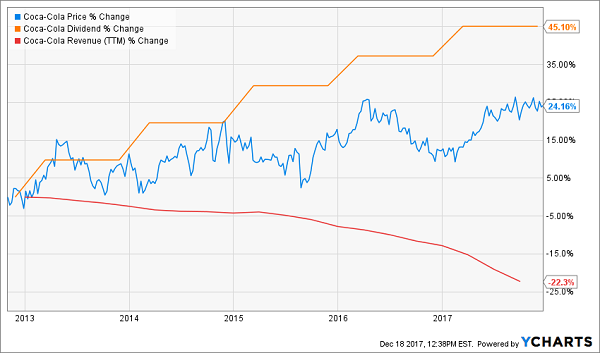 Ecolab (ECL) is one of the “quiet” Dividend Aristocrats, serving boring but vital functions while mostly keeping out of the public eye. But while most consumers haven’t heard of Ecolab, they’ve certainly benefited from its products. ECL is responsible for keeping the power on, keeping the water flowing and keeping everything you come in contact with clean. Ecolab’s Nalco Water division provides water treatment technologies for large-scale industries such as refining and petrochemicals. This helps companies save money by conserving water and energy, plus keeps them in line with ever-changing environmental regulations, but also helping them save money by conserving water and energy. Ecolab also dabbles in everything from kitchen equipment repair to dishwashing solutions to pool and spa maintenance, for customers ranging from businesses to schools to government organizations. 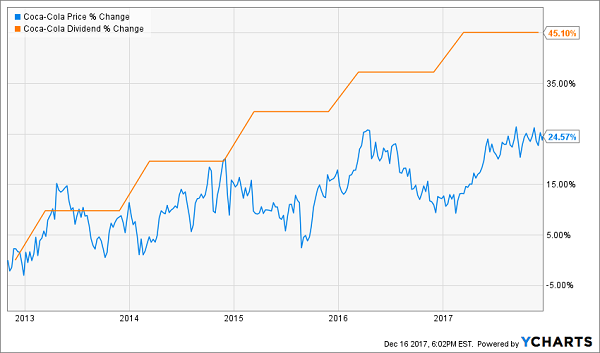 Ecolab generates more than $1 billion in free cash flow every year, and the company is modeling as much as 16% earnings growth next year, while analysts are looking for a 15% pop. In fact, they’re pretty bullish on the company’s prospects even further into the future, with Wall Street’s pros looking for 13% annual bottom-line growth from now through 2023. 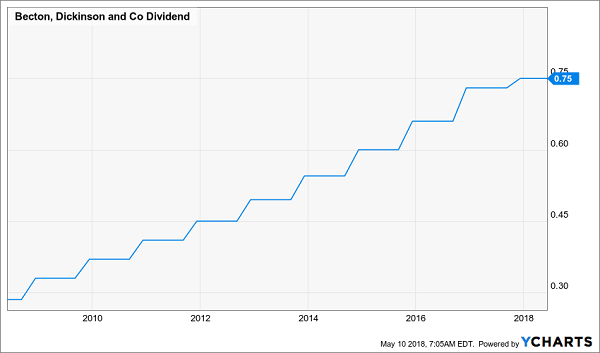 That, as well as a conservative 30% payout ratio, should keep the dividend hikes going well past Ecolab’s 26-year increase streak. 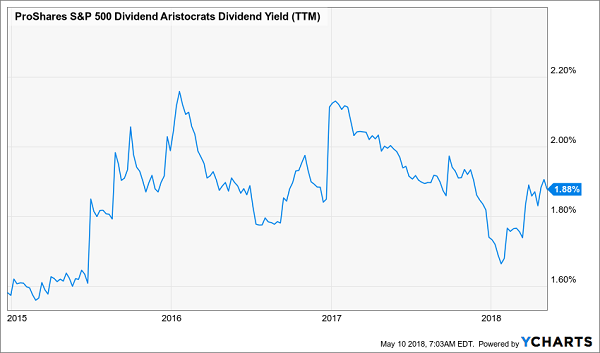 Dividend Aristocrats like 3M and Ecolab are impressive dividend growers, but a portfolio too reliant on Aristocrats will leave your retirement portfolio in haggard shape. In fact, with an average yield of less than 2%, the Aristocrats deliver less income than the 10-year T-note! 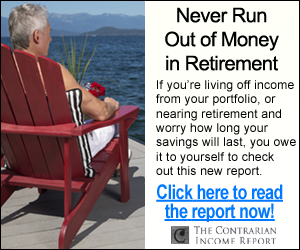 However, I have a portfolio of dividend winners that not only will pay you 4 times more, but will pay you 3 times more often. These monthly dividend payers include a few picks that have remained mostly under the radar despite their high payouts and general quality. For instance, this portfolio includes an 8.7% payer trading at a bizarre 5.3% discount to NAV, and a steady Eddy high-yielder that barely blinks when stocks plummet.